This was an enhancement that i had previously brought to a design meeting in November 2014 after working on it and posting it in redmine ( https://redmine.documentfoundation.org/boards/1/topics/529 ). The single toolbar concept can be found in apps like Google Docs and IBM Symphony and it provides a simplified set of highly used toolbar buttons so that the document can take up the majority of the screen and let users focus on creating their documents. Details of how IBM Symphony achieved this single toolbar mode can be found in this redmine thread ( https://redmine.documentfoundation.org/boards/1/topics/163 ). IMHO it would be great to have both things so user can decide which one they prefer. The current multiple toolbar setup is the default and a user would be able to enable the single toolbar mode, if that is what they prefer. Likely in View > Mode > Single Toolbar Mode. The custom toolbar xml file used in the screenshot is attached for users who want to play with it. This custom toolbar does handle a user's basic writing needs, but it doesnt handle contextual things like when you select an image and wanting to add a border or selecting a shape and wanting to change its border color, though these things can be formatted using the context menu. So a decision has to be made to either do the single toolbar mode as a single toolbar that doesnt change or a group of toolbars that fit on a row that can handle context. So that is pending is the creation of an UNO command to do the following. Notebookbar is another UI mode, but it wont be replacing the current toolbars, but would be an alternative, similar to sidebar mode. 1) May be in this mode also hide menu bar? 2) Add on Single toolbar icons "Normal view"
> 1) May be in this mode also hide menu bar? Not a good idea as without the menu bar users wouldnt be able to access the functions that arent available in the single toolbar. > 2) Add on Single toolbar icons "Normal view"
As its activation would hopefully be in the menu bar as View > Mode > Single Toolbar Mode, its deactivation would likely be in a similar fashion. For those wanting to test out what a single toolbar would be like on Calc, here it is. Just additional idea. Is there any way to create drop-down list of all other toolbars (or at least the most important one), which could be selected and displayed over the current single-toolbar in single-toolbar mode? Something I suggested in https://bugs.documentfoundation.org/show_bug.cgi?id=80752 but implementation does not need to include the "line" above single-toolbar with toolbar names, yet simple drop-down list? > toolbar names, yet simple drop-down list? That is likely something that can be achieved with the notebookbar, so i'd suggest passing your idea onto kendy or samuel along with some mockups of how it would function. When the single toolbar mode UNO command is toggle off, it does the reverse. Kompilainenn, it fits if you use small icons, which is how it is intended to fit for users by default, while users with larger screens can use large icons if they choose. > icons if they choose. by default, Windows build uses large icons on Toolbars. Maybe envisage verification before activation Single Toolbar? Or show notification to the user..."Your monitor have aspect ratio 5:4. Use mode Single Toolbar with small icons or not use it's!"? The Standard (Single Mode) toolbar already has the double >> showing a drop menu of the remaining hidden widget buttons. So use on screens narrower than 1280px or when sized narrow the buttons are available. But can an action of the toggle into the Standard (Single Mode) include adjustment of the Icon size to small? We set Icon Size to Auto by default, can we make use of that? > can we make use of that? Hopefully when a dev looks into creating the uno command mentioned in comment 13, the code can check for the screen resolution and set the icons to small if appropriate. Regarding default items in toolbar. I don't think that "New" and "Open" should be there. It is not something you use often. You open the document or create a new one and you are working on that document. So most of the time, these two items are useless. On the other hand, clicking on the "File" -> "New" or "Open" does not involve two many steps. The missing icon is PDF (dialog with "where to export" appears after clicking, which is different than File -> Export to PDF). That is something LibreOffice user have to use very often when sending files to others since ODT is not standard everywhere yet and it allows us to send document as designed in LibreOffice. My recommendation is to rearrange font text items as well: Style, Font, Size, Bold/ Italic/ underline and then Alignment. 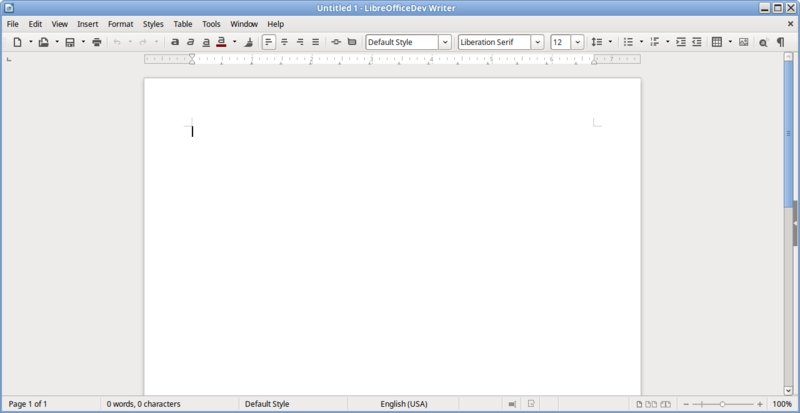 This was standard order in LibreOffice so far as well as in other programs. And about this discussion of large vs. small icon size. Large icons provide better visual appearance so I think it should be default size regardless of monitor size/ resolution. The other argument that goes for large icon size is easier clicking. When icons are small, user have to be very precise in order to select the icon. "16px" is two times smaller place than "32px" which means that you have to be very patient with the mouse. As I mention in (https://bugs.documentfoundation.org/show_bug.cgi?id=99435), one big drawback of the current tool bars is simply that there are just too many unused buttons used. Please read that bug for further information. Screenshot with the crash message. Sometimes moving the toolbar 'Standar (single mode)' from top to left and inverse LibreOffice crash. Screenshot with the second message. Message after click on [Anular]/[Cancel] to the first message. Standar (single mode) not fit stacked to a side, with a 1600x900 screen. What can be without separators in the toolbar. > Screenshot with the crash message. Would suggest you submit that as a new bug, so it can be looked into as i dont assume it is directly related to this enhancement. > Standar (single mode) not fit stacked to a side, with a 1600x900 screen. > What can be without separators in the toolbar. It wasnt intended to fit vertically, especially as the comboboxes (style name, font name, font size) dont function in vertical view. > dont assume it is directly related to this enhancement. > > Standar (single mode) not fit stacked to a side, with a 1600x900 screen. > > What can be without separators in the toolbar. > name, font name, font size) dont function in vertical view. I know comboxes when in vertical only show the icon. With the actual screens usually wider than high, horizontal tool bars are only an space waste (IMO), while there is a lot of unused space on both sides, but only my opinion. Easy activation of single toolbar mode has been done in bug 101249.
verified. takes a few seconds after the selection to actually switch the toolbars which is a bit confusing but works.